Let’s celebrate that Winter is gone. This change of season sparks a desire for a graceful and fresh interior where Nature and powdered colours renew your interior decoration. Spring is best represented by bright colours, beautiful light and a sense of calm. It is time to make it feel like Spring in our homes too! Sometimes just a few pieces are needed to set the scene: beautiful low marble tables, a soft carpet, an inviting large wood table, large plants & flower arrangements, some colourful accent details. From pale pastel colors, nature-like neutrals, floral accents, and fresh patterns, read some of our decorating ideas and styling tips to make if feel like Spring in your home. Spring brings about a sense of softness and grace. The world comes alive after long months of hibernation. The new season is almost like a rebirth for nature and humans alike. Mixing contrasting tones with warm materials is the best way to create a modern and cosy interior. 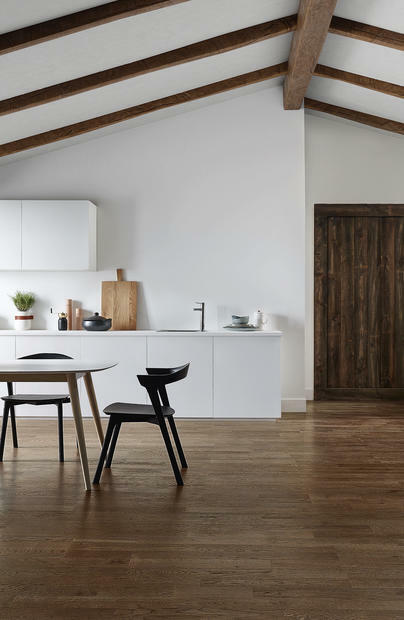 In Scandinavian countries where peace of mind is a way of life, interiors evoke nature with rustic materials in harmonious combination with soft elements. Find inspiration in Scandinavian style decoration to help you turn the center piece of your home into an intimate cocoon, a place for sharing and conviviality. 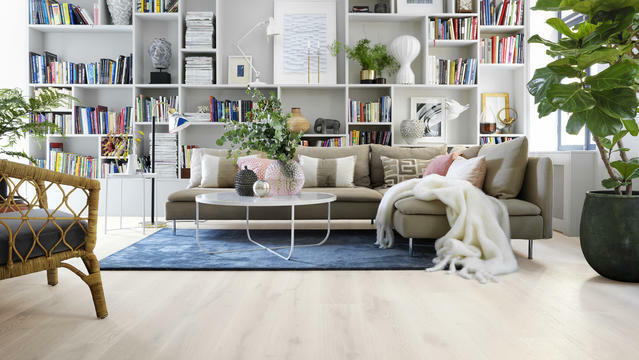 A change of seasons is the perfect time to give your home a breath of fresh air with some new décor ideas, new decoration items, small renovated furniture or a new coat of paint. Choose smooth and rounded lines to give a sense of comfort. Prefer neutral and timeless colours that are pleasing to the eye such as white, beige, grey or taupe. Combine these colours with wood that brings warmth and authenticity, as well as some graphic touches with bold colours or anthracite for a touch of modernity. Using different tones of grey is a great way to draw attention to architectural details or enhance textures. You can combine them with a refreshing palette of pastel colors (powder pink, pale green, light lavender tones..) to add a subtle touch, brighten your space, create a softer décor and a sophisticated look for a fresh, seasonally appropriate style. Bring freshness and eco-friendly chic into Spring decorating, to make your room feel more alive. Green symbolizes renewal, blossoming and growth. Green is also a symbol of balance, calm and harmony, a great colour to introduce in your home this season. To create volume and a dynamic space, mix plants of different shapes & sizes, like one large plant that makes a statement, and a smaller cluster of plants. Odd-numbered clusters of plants work nicely. To avoid it feeling cluttered in your home, keep plants off the floor and go for hanging leafy plants. This will create rhythm and volume as well as personality to any space. By doing this, plants are almost like pieces of art in your home. To go for a tropical look, place plants with a few very large leaves on both sides of a doorway or window. Choose plants with smaller leaves for a more minimalistic look or in smaller spaces. For more harmony, place the plants in a woven pot or basket. Having more plants and caring for them is also a way to make your interior a mix of rustic aesthetics and sensibility, but also to care for your loved ones, as some plants are known to purify indoor air quality on top of helping us to reconnect with Nature. Plants are also known for triggering creativity and reducing stress. You can see them as a form of art that you can place on shelves or hanging in order to create a jungle-like atmosphere. Our commitment for the environment and preserving natural resources is an important part of how we relate to our Home. Letting Nature blossom in your home also means that your values and commitment for the environment can be reflected in your home with renovated or recycled plastic, reclaimed glass, cork and wood objects you love. Repainting old furniture with trendy or soft colours to give them a second life, is a great way to breathe new life into your interior while staying true to your values. A few trendy accents are enough for your house to get a fresh, stylish, and up-to-date look! Giving your home a breath of fresh air can be done with your favourite objects or souvenirs. So be creative and enjoy your new Spring home décor! Enhance your home’s unique look!